1'' Thin: Fits in Tight Ceiling Space. The Goldsuno’s Standard TM 4” & 6” LED flat Downlights combine high quality light output and efficiency while eliminating the need for recessed housing for competitive affordability. The innovative, slim design allows for easy retrofit, remodel for new construction installation from below the ceiling. 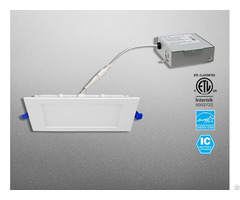 With its narrow design, it can be installed in application with only 2” plenum clearance. 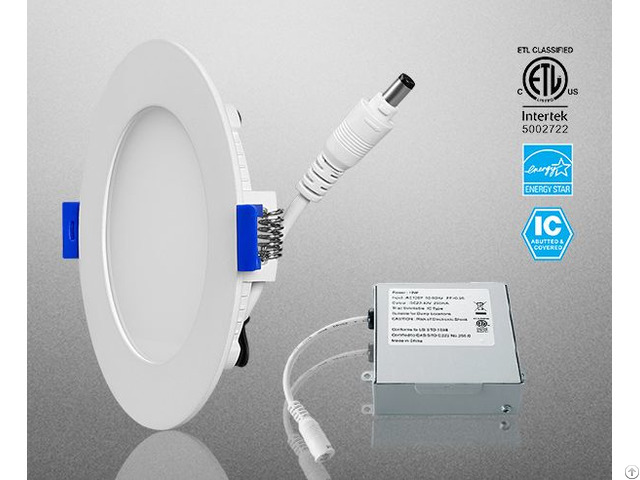 The LED flat Downlight and remote driver with junction box are wet location approved, making them ideal for a breath of indoor residential, hospital, commercial and multifamily application. Order information: For shortest lead times, configure product using standard options. Economic TM 30K: 3000K 80CRI MW: Matte white 4” LED flat Downlights 40K: 4000K MB: Matte black 50K: 5000K BN: Brushed nickle 60K: 6000K *1 Color temperatures conform to nominal CCTs as defined in ANSI Chromaticity Standard C78.377A. *2 Lumen measurement compies with IES LM-79-08 testing procedures. *3 L70 = 70% lumen maintenance (when light output drops below 70% of initial output). Ambient luminaire temperatures specified. Lumen maintenance calculations are based on lifetime prediction graphs supplied by LED source manufacturers. Calculations for white-light LED fixtures are based on measurements that comply with IES LM-80-08 testing procedures. We have subordinate department: shell production, heat-dissipation design and manufacture; LED driver R&D and application; high transmittance, anti-glare PC cover and reflector design and manufacture; SMD automatic produce and assembly; aging testing etc. Since 2009, we have obtained 12 patent technologies. 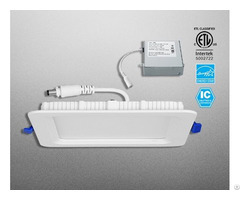 LED down light series were UL, TUV/CE, SAA, RoHS approved. We endeavor in providing customers with stable, high quality and competitive products. Business Description: Shenzhen Goldsuno Opto-electronic Techonology Co. Ltd is a high–tech enterprise integrating R& D, production and selling of LED indoor lighting products, with more than 20 R&D engineers engaged in structure and driver design. Goldsuno Opto-electronic vertical integrate industry chain. We have subordinate department: shell production, heat-dissipation design and manufacture; LED driver R&D and application; high transmittance, anti-glare PC cover and reflector design and manufacture; SMD automatic produce and assembly; aging testing etc. Since 2009, we have obtained 12 patent technologies. 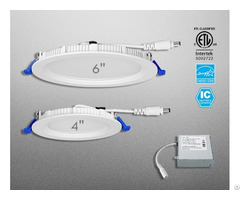 LED down light series were UL, TUV/CE, SAA, RoHS approved. We endeavor in providing customers with stable, high quality and competitive products.